A guy walks into a bar…and there’s a good chance he’s wearing one too. Also know as a tie clip (but not to be mistaken with a clip-on tie), a tie bar can keep your neckwear in place in a wind storm, sure, but it also adds a bit of stylish flair to an otherwise staid outfit. This little piece of metal can add a lot to your outfit, but you’ve got to do it right. Below, a primer on the right way to wear a tie bar, and some flashing caution signs about how not to wear it, too. Don’t get caught with your tie clip in the wrong spot! Placement is everything. Too high and the purpose is lost, too low and you run the risk of losing sight of your navel. The sweet spot is right between the third and fourth buttons of your shirt. And don’t get clever with its angle: your tie clip ought to be perpendicular to your tie. Make sure your tie clip does not over lap your tie. For example, don’t wear a tie clip that is two and a half inches wide when your tie is only two inches wide. It will look sloppy. As a rule of thumb, aim for your tie clip to cover about ¾ of the tie. 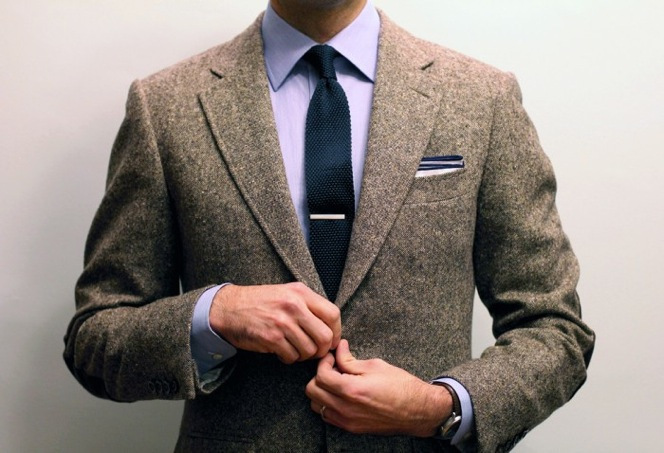 The tie clip can be worn as a fashion statement but it’s really not meant to be just for show. Use it to its full potential by clipping both sides of the tie to your shirt. Another important thing to consider when wearing a tie clip is your outfit that day. Stick to one metal for the whole outfit- watch and tie clip should match to achieve the put together look you’re aiming for. Try and stay away from colorful tie clips. It can look tacky and take away from your outfit. Don’t wear your tie clip with a vest, cardigan or anything along those lines. Why? Don’t forget that the original purpose of the tie clip is to hold down the tie and it will be overkill if you have it held down with a tie clip and a vest. Are you a tie bar man? Why or why not?